The Lake Havasu Area Chamber Ambassadors held a ribbon cutting ceremony for Whiz Kid Computer Services celebrating 10 years in business and its new Chamber membership. 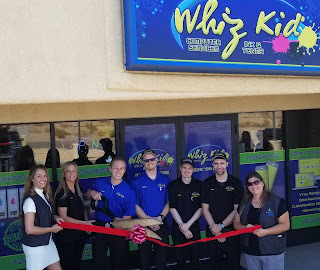 Whiz Kid is a one-stop shop for computer repair, printer ink and toner supplies. Commercial and Residential solutions for I.T. support and network management with certified technicians. Attending the ceremony from left to right were Debi Pennington, Hana Skersick, Vince Beltran, Brett Telliard, James Morgan, Ryan Shamowski and Teri Jameson.